40 mm 18K Sedna gold case, transparent back, scratch-resistant sapphire crystal anti-reflective treatment on both sides, domed opaline-silver dial features 18K Sedna™ gold hands and indexes, and a date window at 6 o'clock, Caliber Omega 8511 manual-winding movement with co-axial escapement, chronometer, date, approximately 60 hours of power reserve, brown leather strap. Water resistant to 3 bar (30 metres / 100 feet). 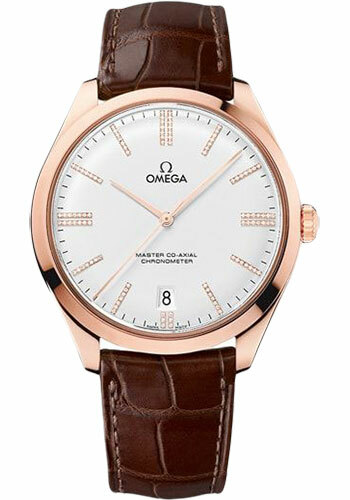 40 mm 18K Sedna gold case, transparent back, diamond-set bezel, scratch-resistant sapphire crystal anti-reflective treatment on both sides, domed white mother-of-pearl dial with polished 18K gold hands and a date window at 6 o'clock, Caliber Omega 8511 manual-winding movement with co-axial escapement, chronometer, date, approximately 60 hours of power reserve, brown leather strap. Water resistant to 3 bar (30 metres / 100 feet).